The UK's Ministry of Defence drew up plans to defend the British overseas territory of Gibraltar against a potential Libyan attack amid fears that London's support for the 1986 US bombing of Tripoli and Benghazi may have prompted a Libyan retaliation, a recently declassified top secret report has shown. "Following US military action against Libya there is an increased risk of Libyan attack on UK targets," the report, cited by The Times, indicated. 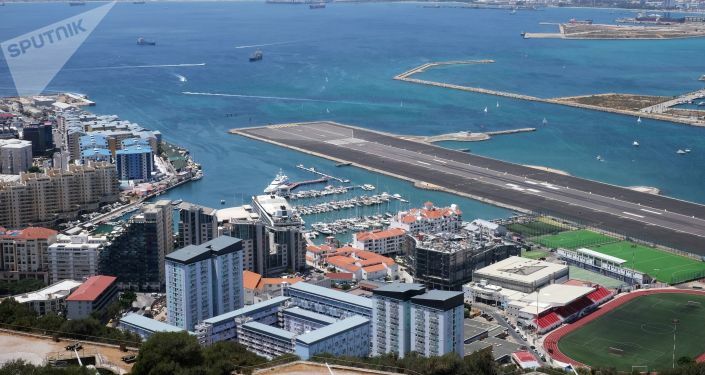 "The relative proximity of Gibraltar and the fact that its naval installation and airfield have in the past provided support for US units makes it a potential target for such an attack," the report added. Judging Libya's Soviet-supplied Tupolev Tu-22 bombers to have sufficient range to strike Gibraltar with five 1,000 kg bombs dropped from an altitude of up to 35,000 feet, the report cited guidelines approved by the cabinet allowing for enemy aircraft demonstrating "hostile intent" to be attacked. "Any unidentified aircraft or suspected hostile aircraft in or approaching Gibraltar is to be positively identified by any means available. If an aircraft is identified as a Libyan combat aircraft it is to be diverted from a course which could take it over Gibraltar. If the aircraft continues on a direct track towards Gibraltar a warning burst of gunfire may be fired," the guidelines indicated. Libyan Tu-22s escorted by a US fighter, file photo. Officials also reportedly feared that Gibraltar may be targeted with terrorist attacks, with the declassified report citing "various terrorist organisations in Spain which have explosives and are linked to Libya" that could be used to stage such attacks, and the apparent danger posed by Gibraltar's "large North African Arab population and regular ferry links to Morocco." These fears prompted more careful scrutiny of "any new Moroccan or other Arab national visitors coming from Morocco" to Gibraltar, and refusal of entry to those deemed associated with Libya. The secret report prompted London to deploy Royal Air Force Phantom interceptor aircraft and Rapier surface-to-air missile systems to Gibraltar, notwithstanding concerns that such a move could lead to increase with the UK's Spanish allies. "Any reinforcement of Gibraltar to meet the air defence threat would have to be explained to the Spanish. The risk of engaging a false target, eg a Spanish fighter, is totally unacceptable politically," a Ministry of Defence brief noted. The brief justified the deployment, however, by noting that it would prove "damaging" to the UK "if it became known that a Libyan aircraft which had bombed Gibraltar had got away because UK forces had had to give up the chase." According to The Times, the fighter and SAM deployment was withdrawn in June 1986, after the alleged Libyan threat was deemed to have receded. On 15 April 1986, the US military conducted a series of airstrikes against multiple targets throughout Libya, including Gaddafi's residence in Tripoli which he and his family had evacuated just in time after a warning phone call from Italian Prime Minister Bettino Craxi. About 60 Libyan military personnel and civilians, including a baby girl, were killed in the strikes. Two US Air Force pilots were also killed after their F-111 fighter-bomber was shot down over the Gulf of Sidra. The US strikes were a response to the bombing of the La Belle nightclub in West Berlin on 5 April 1986, in which three people were killed, including two US troops and a Turkish woman, and over 200 people, including 79 US nationals, mostly servicemen, were injured. President Ronald Reagan accused the Libyan government of involvement in the attack. Tripoli long denied any role in the discotheque attack, but did pay compensation over the bombing and other terrorist incidents an attempt to restore relations with Europe and the US in October 2008. In the mid-1980s, the Soviet Navy enjoyed access to Libyan port facilities in Tripoli and Tobruk, and maintained several thousand military advisers in the country at any one time. These specialists' activities included beefing up Libya's air defences amid regular US-Libyan skirmishes. In accordance with the geopolitical realities of the mid-1980s, a major escalation between NATO and Libya carried the risk of increasing tensions between the US and USSR and their respective blocs.